The worksheet contains a scheme of the degrees of comparison (with examples) which explaines the rules of the degrees of comparison as ajectives. 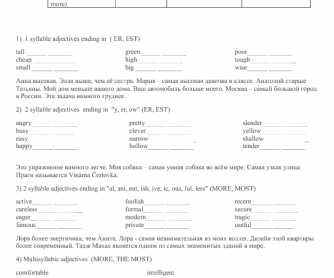 It also contains 4 points (a point for each type fo adjective) with exercises. There is also a 3 point note (also with exercises) on spelling rules and a small test about the topic.